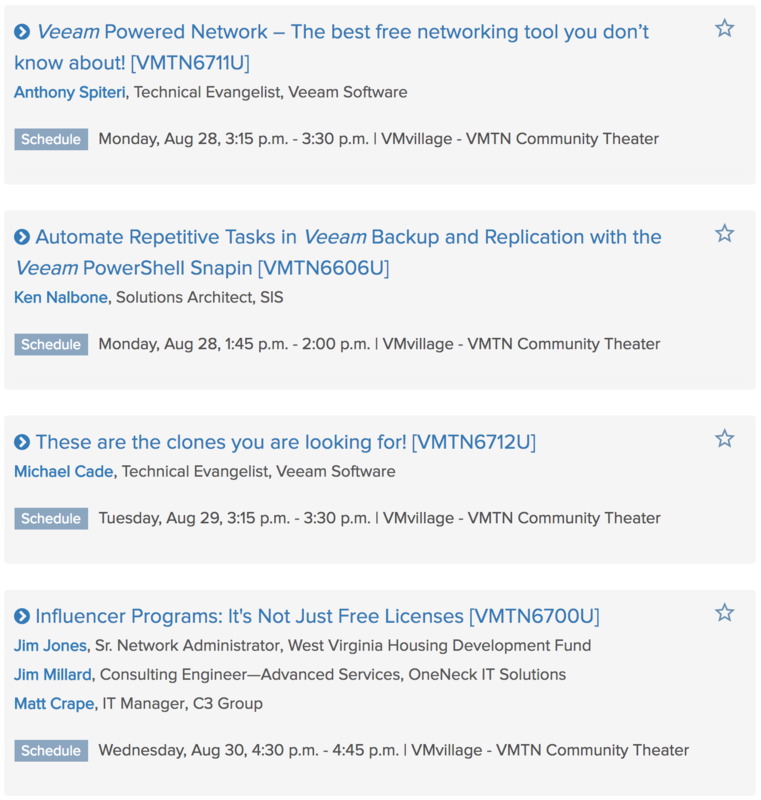 You searched for vExpert - Page 2 of 5 - VIRTUALIZATION IS LIFE! 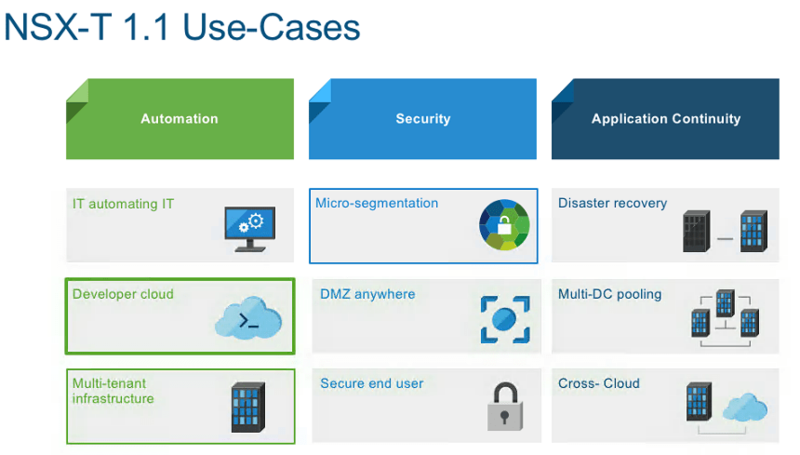 In Feburary of this year VMware released NSX-T 2.0 and with it came a variety of updates that looked to continue to push of NSX-T beyond that of NSX-v while catching up in some areas where the NSX-v was ahead. The NSBU has big plans for NSX beyond vSphere and during the NSX vExpert session we saw how the future of networking is all in software…having just come back from AWS re:Invent I tend to agree with this statement as organisations look to extend networks beyond traditional on-premises or cloud locations. NSX-T’s main drivers relate to new data centre and cloud architectures with more hetrogeneality driving a different set of requirements to that of vSphere that focuses around multi-domain environments leading to a multi-hypervisor NSX platform. NSX-T is highly extensible and will address more endpoint heterogeneity in future releases including containers, public clouds and other hypervisors. As you can see before the existing use cases for NSX-T are mainly focused around devops, micro-segmentation and multi-tenant infrastructure. Layer 3 accessibility across all types of platforms. 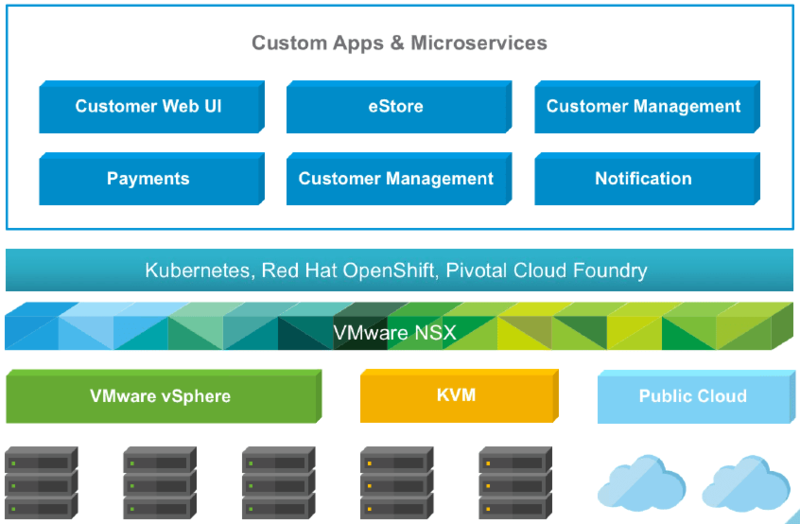 Today at Pivotal SpringOne, VMware is launching version 2.1 of NSX-T and with it comes a networking stack underpinning Pivotal Container Services, direct integration with Pivotal Cloud Foundry and significant enhancements to load balancing capabilities for OpenStack Neutron and Kubernetes ingress. These load balancers can be virtual or bare metal. There is also native networking and security for containers and Pivotal operations manager integration. As well as the above it will have L7 manipulation as will as OpenStack and Kubernetes ingress. Like NSX-v these edges can be deployed in various sizes depending on the workload. For those that may not know, PCF is a cloud native platform for deploying and operating modern applications and in that NSX-T providers the networking to support those modern application. This is achieved via the Network Container Plugin. Cloud Foundry NSX-T topology include a separate network topology per orginization with every organization getting one T1 router. Logical switches are then attached per space. High performance north/south routing uses NSX routing infrastructure, including dynamic routing to the physical network. For east/west traffic that happens container to container with every container having distributed firewall rules applied on it’s interface. There is also a number of visibility and troubleshooting counters attached to every container. NSX also controls the IP management by supplying subnets from IP blocks to namespaces and individual IPs and MACs to containers. 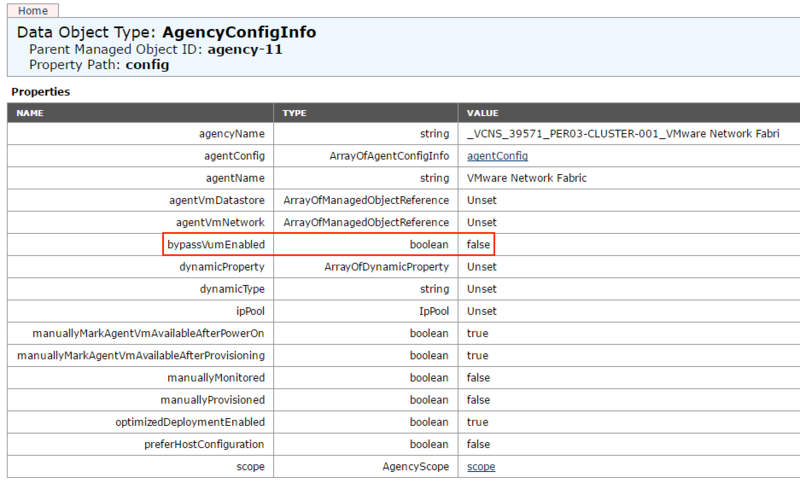 As part of this release there is also a new Log Insight NSX-T Content Pack that builds on the new visibility and troubleshooting enhancements mentioned above and allows Log Insight to monitor a lot of the container infrastructure with NSX. 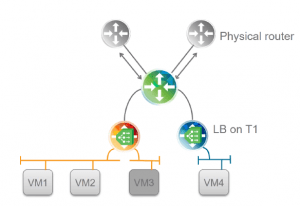 When it comes to the NSX-T 2.1 feature capabilities, the load balancing is a case of bringing NSX-T up to speed to where NSX-v is, however the thing to think about is that how those capabilities will or could be used beyond vSphere environments…that is the big picture to consider here around the future of NSX and it can be seen with the deeper integration into Pivotal Cloud Foundry. 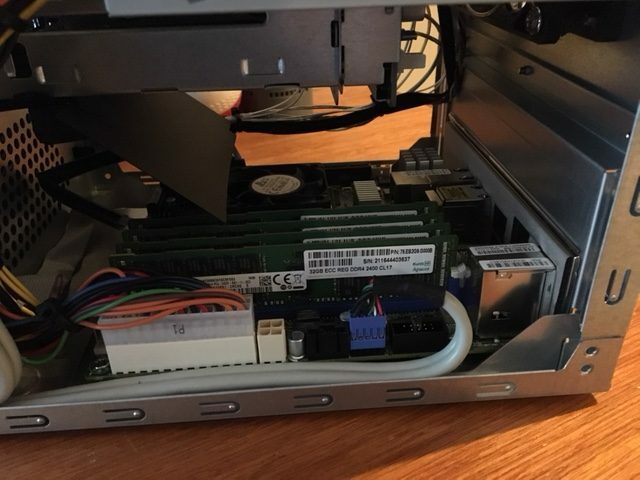 A couple of months ago in my NSX-v 6.3 and NSX-T 1.1 release post I focused around NSX-v features as that has become the mainstream version that most people know and work with…however NSX, in it’s Nicira roots has always been about multi-hypervisor and has always had an MH version that worked with Openstack deployments. The NSBU has big plans for NSX beyond vSphere and during the NSX vExpert session we got to see a little about how NSX-T will look beyond version 1.1. The short answer to this is a focus on expanding NSX to public clouds, containers and platform as a service workloads. We have already seen a tech preview at VMworld of NSX working with AWS instances and the partnership between VMware and AWS is even more of a driver for this cross cloud compute and networking landscape to allow NSX-T to shine. 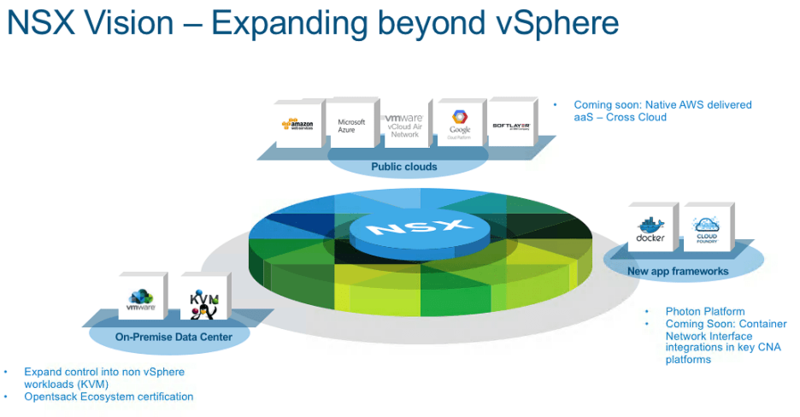 When it comes to the NSX-T 2.0 feature capabilities, many of them are a case of bringing NSX-T up to speed to where NSX-v is, however the thing to think about is that how those capabilities will or could be used beyond vSphere environments…that is the big picture to consider here around the future of NSX! 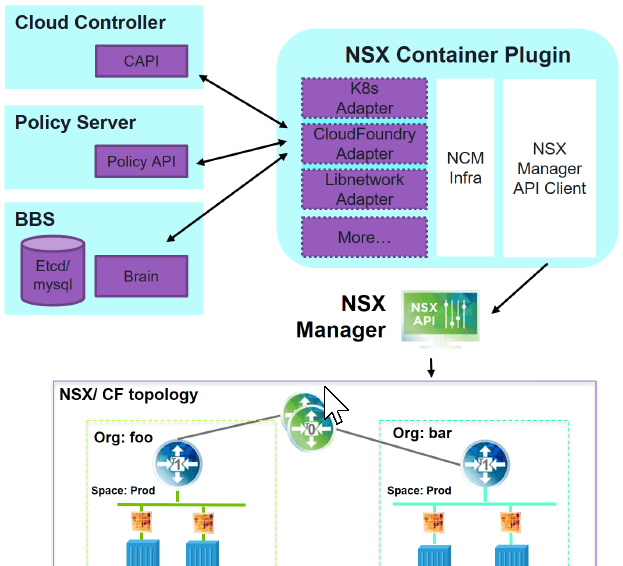 For an overview of what’s was released in NSX-T 2.0, the release notes can be found here, or have a read of my launch post here. After ensuring that my Update Manager was in a good state I was left scratching my head…that was until some back and forth in the vExpert Slack #NSX channel relating to a new VMwareKB that was released the same day as NSX-v 6.3. 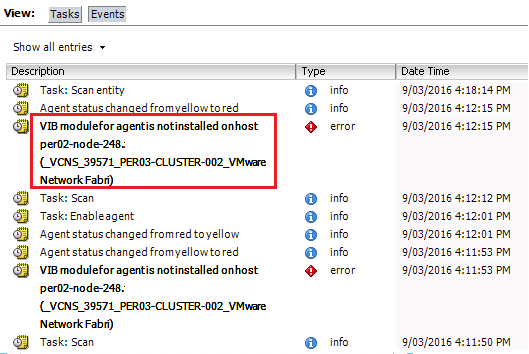 This issue occurs if vSphere Update Manager (VUM) is unavailable. EAM depends on VUM to approve the installation or uninstallation of VIBs to and from the ESXi host. Even though my Upgrade Manager was available I was not able to upgrade through Host Preparation. It seem’s like vSphere 6.x instances might be impacted by this bug but the good news is there is a relatively easy workaround as mentioned in the VMwareKB that bypasses the VUM install mechanism. 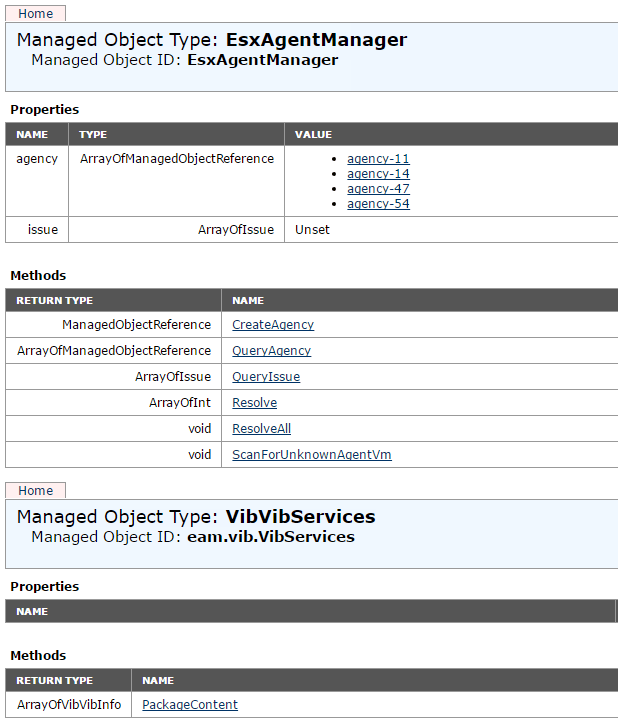 To enable the workaround you need to enter into the Managed Object Browser of the vCenter EAM by going to the following URL and entering in vCenter admin credentials. The value that needs to be changed is the bypassVumEnabled boolean value as shown below. Once invoked you should be able to go back into the Web Client and click on Resolve under the Cluster name in the Host Preparation Tab of the NSX Installation window. Once done I was in an all Green state and all hosts where upgraded to 6.3.0.5007049. Once all hosts have been upgraded it might be a useful idea to reverse the workaround and wait for an official fix from VMware. NSX has seen significant growth for VMware over the past twelve to eighteen months driven mostly from customer demand focusing around micro-segmentation, IT automation and efficiency and also the need to have extended multiple data centre locations that can be pooled together. To highlight the potential that remains with NSX-v less that 5% of the total available vSphere install base has NSX-v installed…and while that could have something to do with the initial restrictions and cost of the software it still represents enormous opportunity for VMware and their partners. Last week the NSX vExpert group was given a first look at what’s coming in the new releases…below is a summation of what to expect from both NSX-v 6.3 and NSX-T 1.1. Note that we where not given an indication on vSphere 6.5 support so, like the rest of you we are all waiting for the offical release notes. Please note that VMware vSphere 6.5a is the minimum supported version with NSX for vSphere 6.3.0. 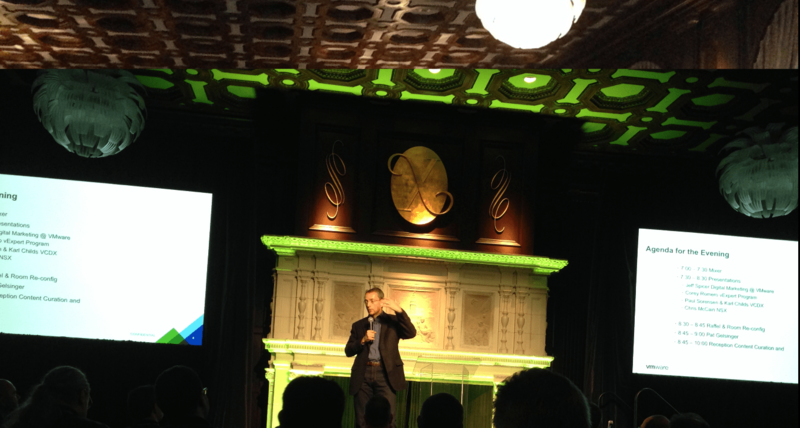 For the most up-to-date information, see the VMware Product Interoperability Matrix. Also, see 2148841. 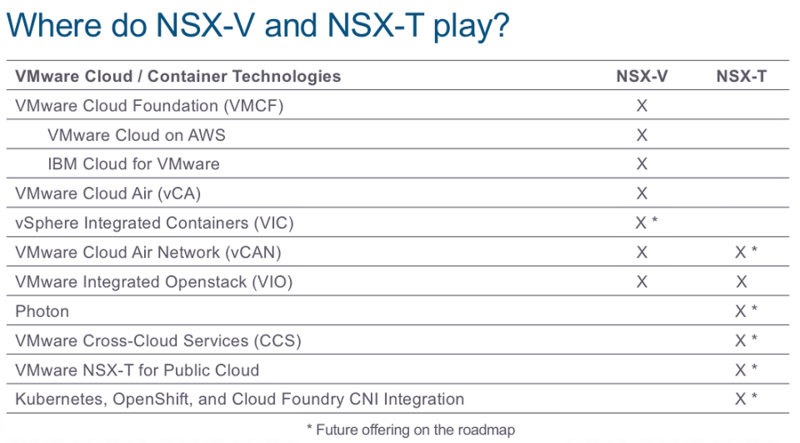 Given there was some confusion about NSX-v vs. NSX-t in terms of everything going to a common code base starting from the transformers release it was highlighted that VMware’s primary focus for 2017 hasn’t shifted away from NSX for vSphere and will still be heavily invested in to add new capabilities in and beyond 6.3 and that there will be a robust roadmap of new capabilities in future releases with support extended will into the future. NSX-t’s main drivers related to new data centre and cloud architectures with more hetrogeneality driving a different set of requirements to that of vSphere that focuses around multi-domain environments leading to a multi-hypervisor NSX platform. NSX-t is highly extensible and will address more endpoint heterogeneity in future releases including containers, public clouds and other hypervisors. As you can see before the existing use cases for NSX-t are mainly focused around devops, micro-segmentation and multi-tenant infrastructure. Again the focus is around private IaaS and multi-hypervisor support for development teams using dev clouds and employing more devops methodologies. There isn’t too much to write home about in the 1.1.0 release but there is some extended hypervisor support for KVM and ESXi, more single or multi-tenant support and some performance and resiliency optimizations. 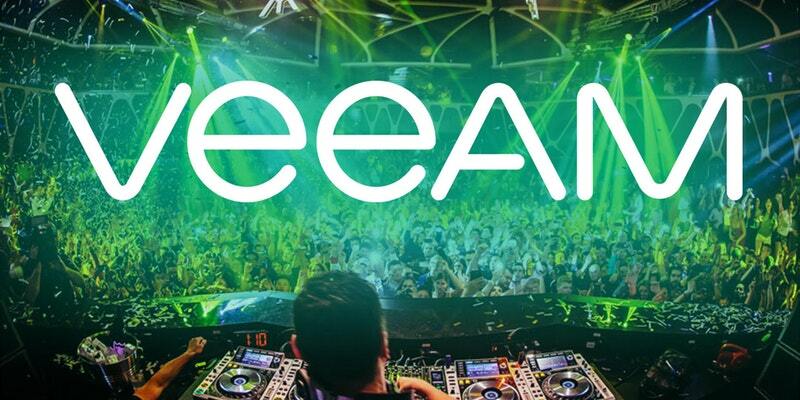 There is a lot to like about where VMware is taking NSX and both product streams offer strong network virtualization capabilities for customers to take advantage of. There is no doubt in my mind that the release of NSX-v 6.3 will continue to build on the great foundation laid by the previous NSX versions. When the release notes are made available I will do take a deeper look into all the new features and enhancements and tie them into what’s most useful for service providers. 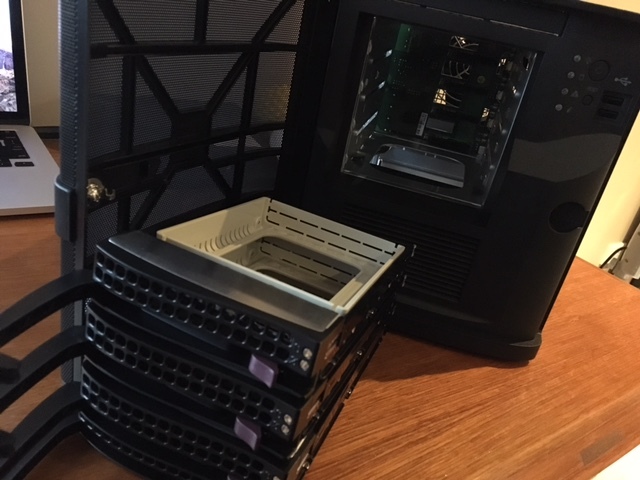 While I was at Zettagrid I was lucky enough to have access to a couple of lab environments that where sourced from retired production components and I was able to build up a lab that could satisfy the requirements of R&D, Operations and the Development team. By the time I left Zettagrid we had a lab that most people envied and I took advantage of it in terms of having a number of NestedESXi instances to use as my own lab instances but also, we had an environment that ensured new products could be developed without impacting production while having multiple layers of NestedESXi instances to test new builds and betas. 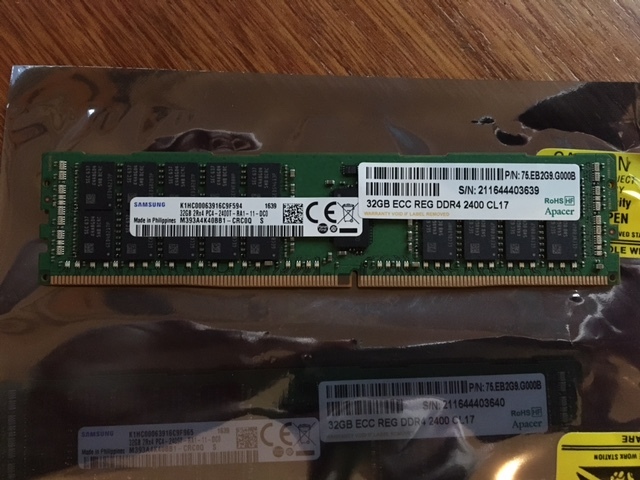 With me leaving Zettagrid for Veeam, I lost access to the lab and even though I would have access to a nice shiny new lab within Veeam I thought it was time to bite the bullet and go about sourcing a homelab of my own. 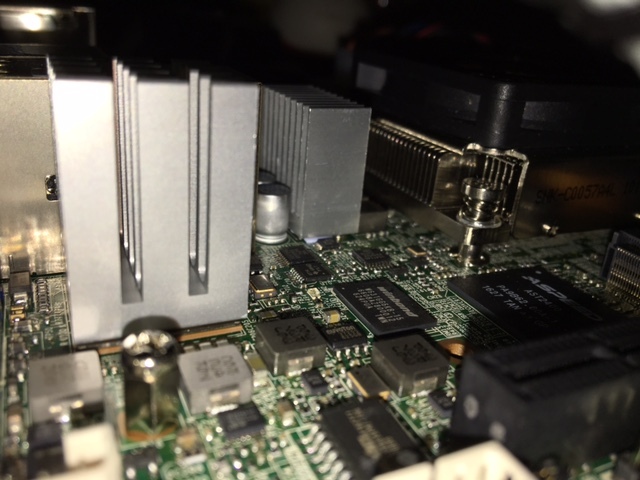 The main reasons for this was to have something local that I could tinker with which would allow me to continue playing with the VMware vCloud suite as well as continue to look out for new products allowing me to engage and continue to create content. 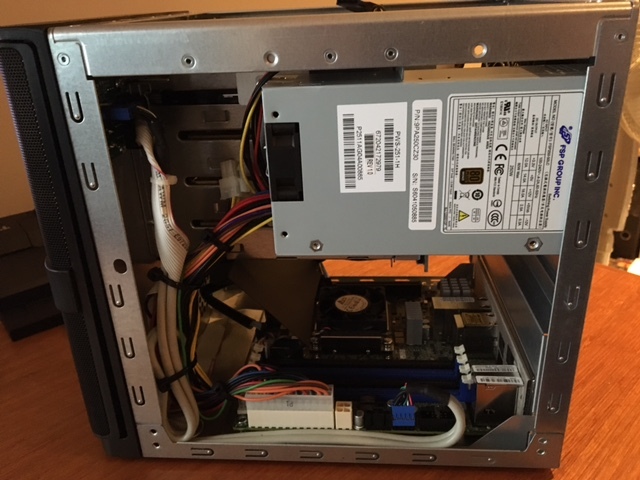 For me, my requirements where simple; I needed a server that was powerful enough to run at least two NestedESXi lab stacks, which meant 128GB of RAM and enough CPU cores to handle approx. twenty to thirty VMs. 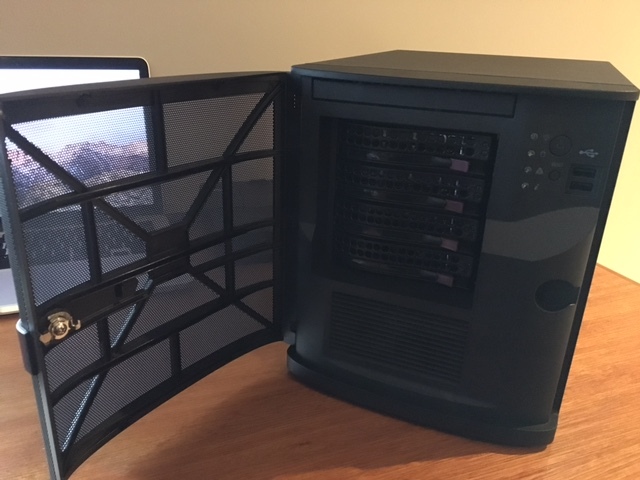 At the same time I needed to not not blow the budget and spend thousands upon thousands, lastly I needed to make sure that the power bill was not going to spiral out of control…as a supplementary requirement, I didn’t want a noisy beast in my home office. I also wasn’t concerned with any external networking gear as everything would be self contained in the NestedESXi virtual switching layer. To be honest, the search didn’t take that long mainly thanks to a couple of Homelab Channels that I am a member of in the vExpert and Homelabs-AU Slack Groups. 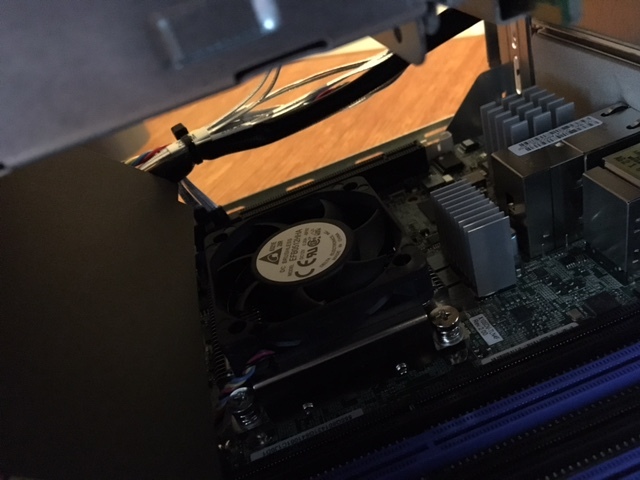 Given my requirements it quickly came down to the SYS-5028D-TN4T Xeon D-1541 Mini-tower or the SYS-5028D-TN4T-12C Xeon D-1567 Mini-tower. Paul Braren at TinkerTry goes through in depth why the Xeon D processors in these SuperMicro Super Servers are so well suited to homelabs so I won’t repeat what’s been written already but for me the combination of a low power CPU (45w) that still has either 8 or 12 cores that’s packaged up in such a small form factor meant that my only issue was trying to find a supplier that would ship the unit to Australia for a reasonable price. Digicor came to the party and I was able to source a great deal with Krishnan from their Perth office. 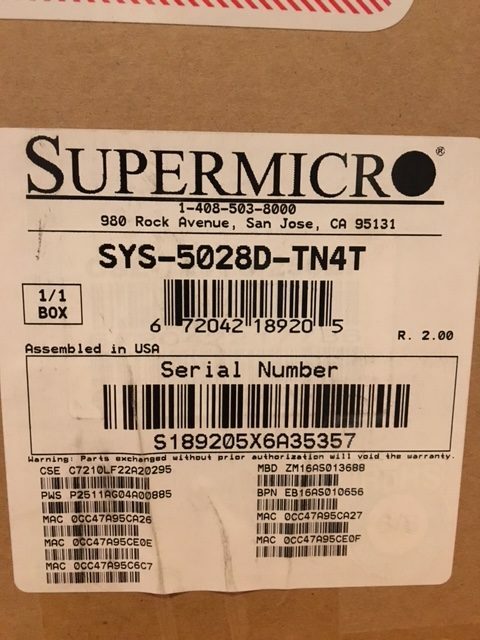 There are not too many SuperMicro dealers in Australia, and there was a lot of risk in getting the gear shipped from the USA or Europe and the cost of shipping plus import duties meant that going local was the only option. 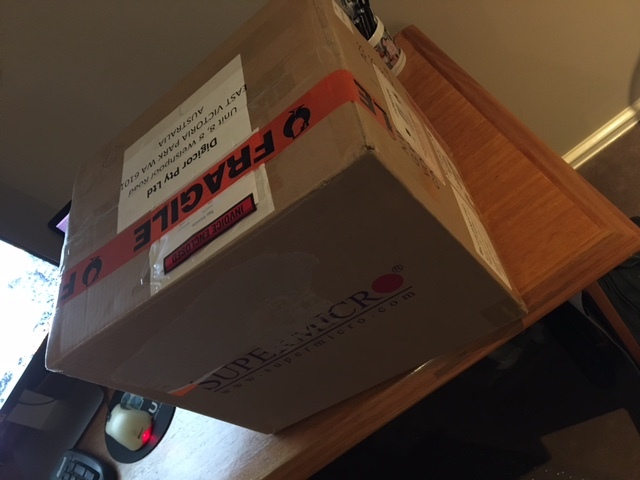 For those that are in Australia, looking for SuperMicro Homelab gear, please email/DM me and I can get you in touch with the guys at Digicor. I decided to go for the 8 core CPU mainly because I knew that my physical to virtual CPU ratio wasn’t going to exceed the processing power that it had to offer and as mentioned I went straight to 128GB of RAM to ensure I could squeeze a couple of NestedESXi instances on the host. In addition to what comes with the Super Server bundle I purchased 2x Samsung EVO 850 512GB SSDs for initial primary storage and also got the SanDisk Ultra Fit CZ43 16GB USB 3.0 Flash Drive to install ESXi onto as well as a 128GB Flash Drive for extra storage. 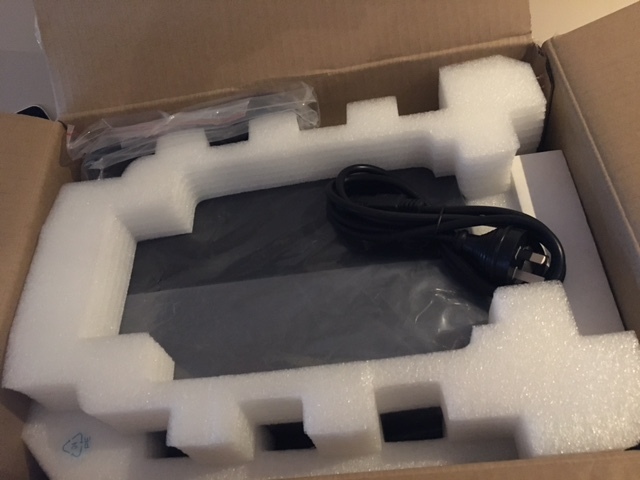 Small package, that hardly weighs anything…not surprising given the size of the case. Nicely packaged on the inside. 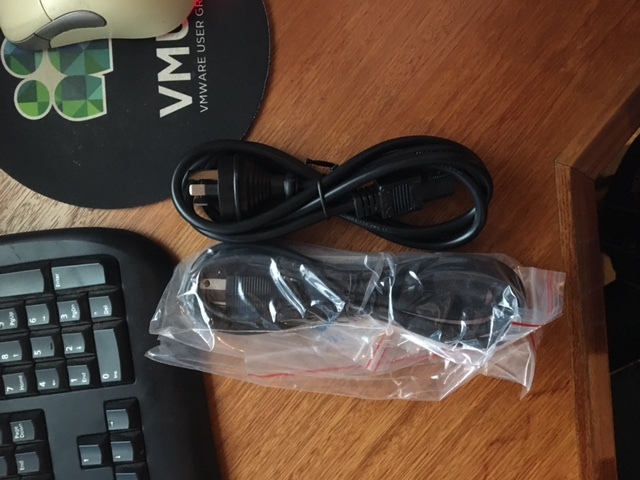 Came with a US and AU kettle cord which was great. 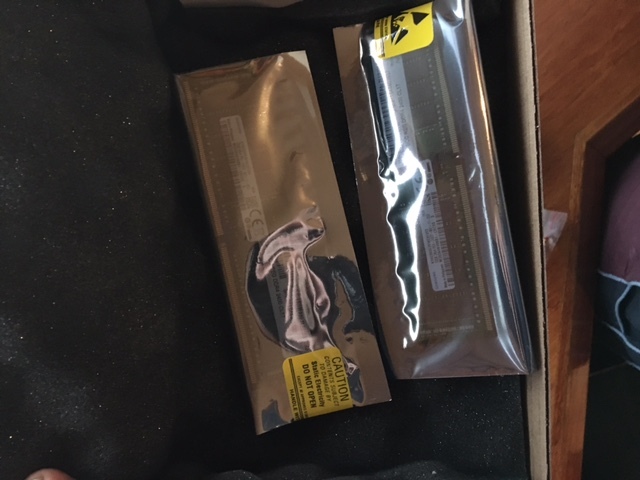 The RAM came separately boxed and well wrapped in anti-static bags. You can see a size comparison with my 13″ MBP in the background. 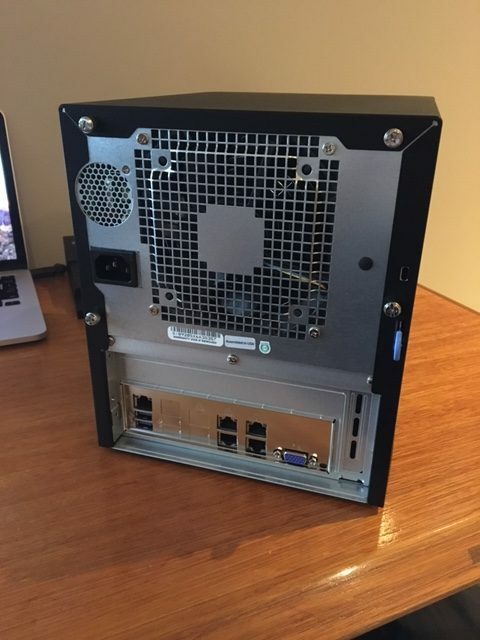 The back is all fan, but that doesn’t mean this is a loud system. In fact I can barely hear it purring in the background as I sit and type less than a meter away from it. One great feature is the IPMI Remote Management which is a brilliant and convenient edition for a HomeLab server…the network port is seen top left. 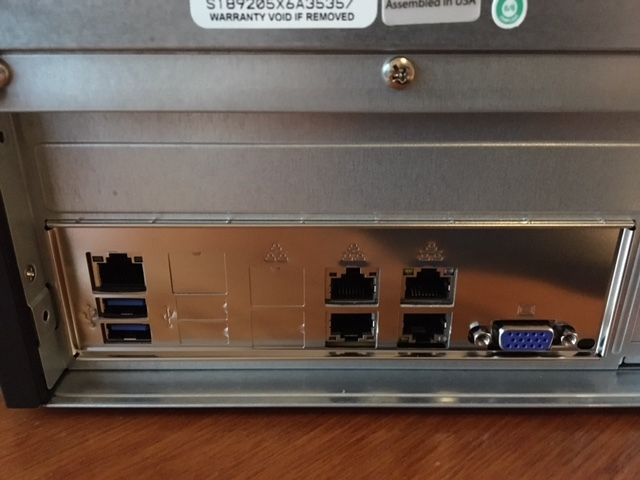 On the right are the 2x10Gig and 2x1Gig network ports. 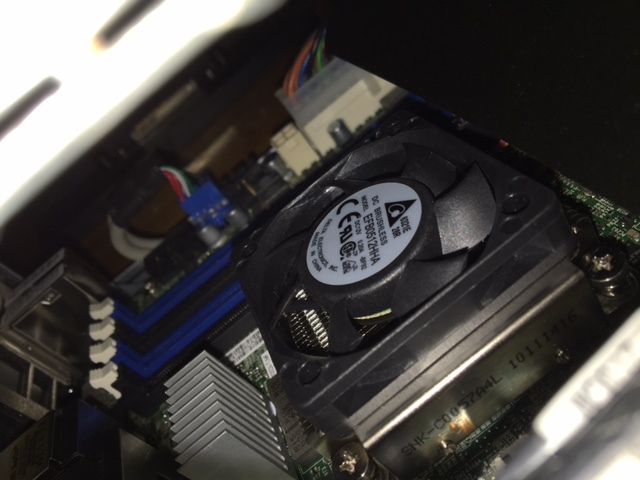 The X10SDV-TLN4F motherboard is well suited to this case and you can see how low profile the CPU fan is. 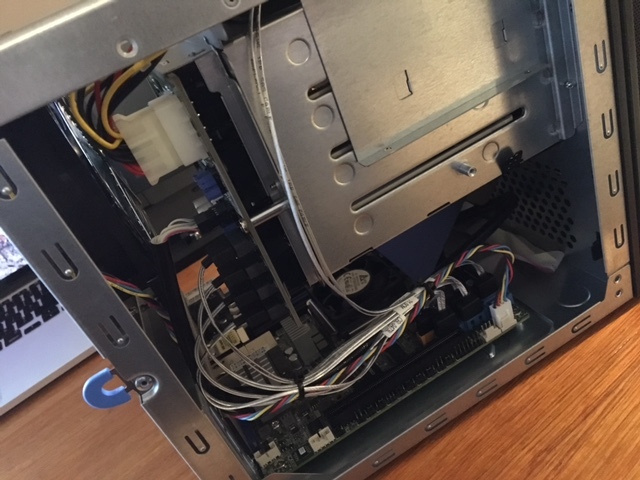 Installing the RAM wasn’t too difficult even through there isn’t a lot of room to work with inside the case. 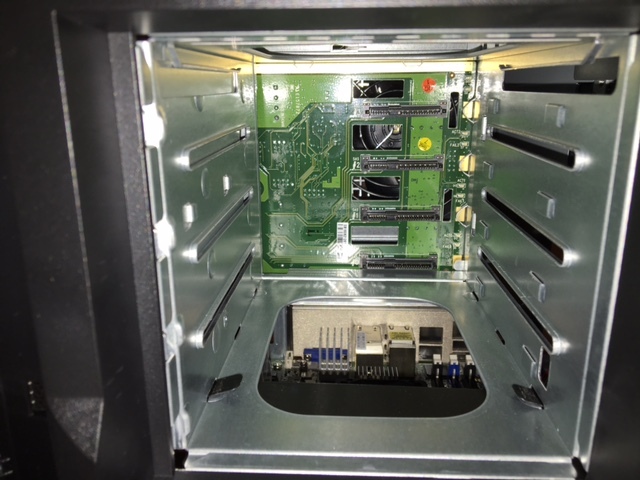 Finally, taking a look at the HotSwap drive bays…I had to buy a 3.5 to 2.5 inch adapter to fit in the SSDs, however I did find that the lock in ports could hold the weight of the EVO’s with ease. 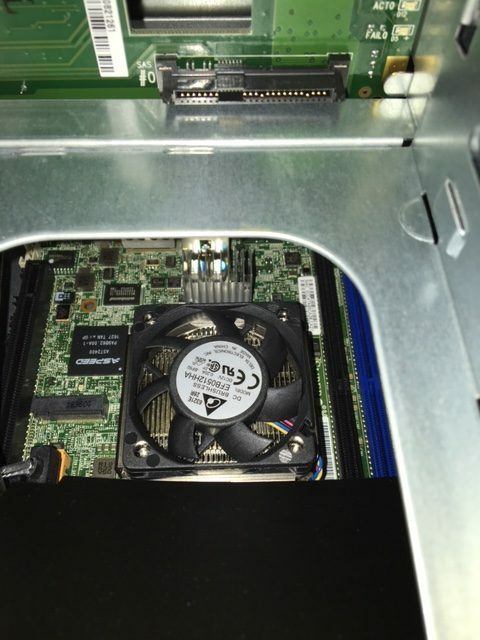 This is a brilliant bit of kit and it’s perfect for anyone wanting to do NestedESXi at home without worrying about the RAM limits of NUCs or the noise and power draw of more traditional servers like the R710’s that seem to make their way out of datacenters and into homelabs. 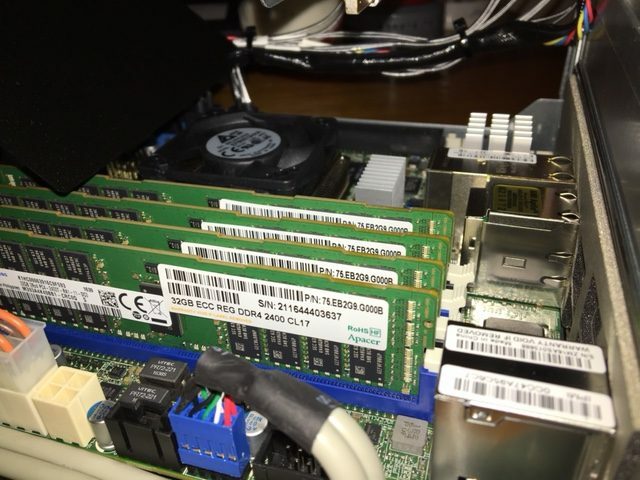 The 128GB of RAM means that unless you really want to go fully physical you should be able to nest most products and keep everything nicely contained within the ESXi Host compute, storage and networking. Thanks again to Krishnan at Digicor for supplying the equipment and to Paul Braren for all the hard work he does up at TinkerTry. 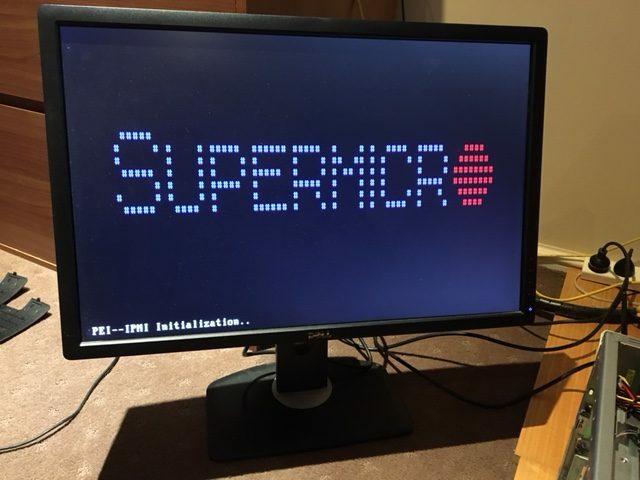 Special mention also to my work colleague, Michael White who was able to give me first hand experience of the Super Servers and help make it a no brainer to get the 5028D-TNT4. 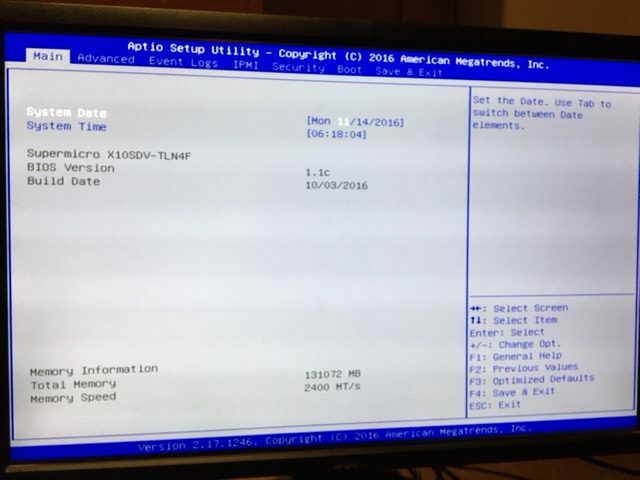 I’ll follow this post up with a more detailed a look at how I went about installing ESXi and how the NestedESXi labs look like and what sort of performance I’m getting out the the system.